The colder temperatures this week have brought out a few critters. When we put up the squirrel-proof bird feeder I did feel a little bad so it is nice to know the squirrels are enjoying some of the fallen seed. They also nibble on our pine cones, leaving an 'apple core' behind. After I snapped the first picture of this little guy I think he sensed I was there. He perked right up and you can see a tiny seed on the side of his nose. I now have a new appreciation for the squirrels. He is so cute - I should give him a name. Any suggestions? Happy Friday and have a wonderful weekend everyone! Hi Donna...I'm so glad you stopped by a few minutes ago to visit with me and showing kindness in leaving a comment. Your squirrel photos [which, by the way I love to watch them] are fantastic. Yes, they do sense us humanoids. From far away too. They know. ps...how 'bout Nuttin' Honey for a name? Why when we first moved in they went along the telephone line and jumped on to our home and dug a hole in it to get into our attic and nested. Boy, did that cost us, but yes they are cute. :) Have a great weekend. Now let me see if I can find your followers section and I'll follow you. Hope you did the same when you stopped by. Ciao my new friend. Nice to meet ya! That squirrel is so cute--he looks like he's got quite a chubby tummy going on in that second picture (he's not the only one--what happened to my waistline when I hit 40 and beyond??) Have a great weekend! Call him "dinner." ha ha Just kidding, though I used to have neighbors who said they ate squirrels. Weird, huh? Okay, so I'm not so hot at the naming game! Hope you have a wonderful Friday and weekend. Hi Donna, Thanks for stopping by my blog today. 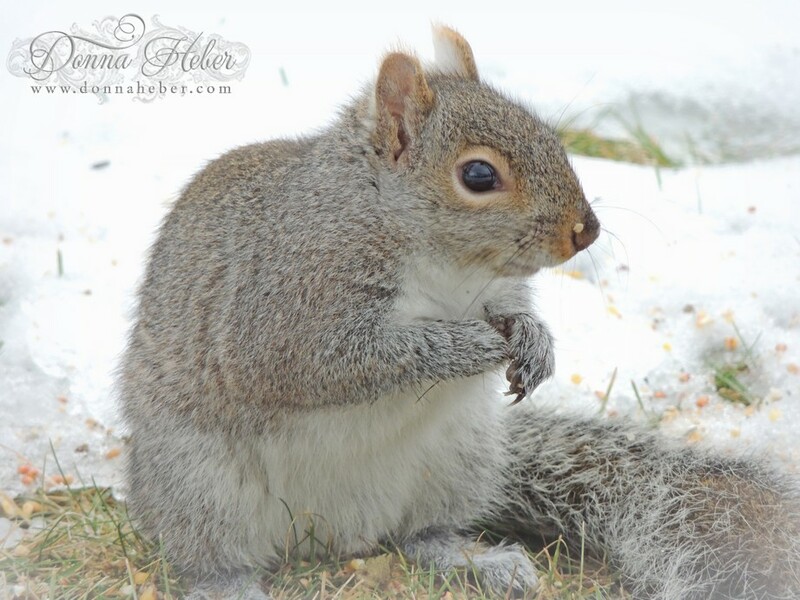 I love the squirrel, with his little be-seeded nose! Happy Friday! (And I think Nuttin' Honey is a cute name too! Love those photos. Who don't have squirrels here in Australia so it's fun to see what turns up in other people's yards! I have been invaded with squirrel's this past few weeks..Red Tail one's also..I love these two shots as having the tail curled up like this is so awesome..and yes, he know's a picture is being taken..LOL! Maybe name him...Mr.Grey..LOL! We have our own squirrel too, and leave snacks for him because I always feel badly (like you do!) when feeders are designed to keep them out. They get hungry too! Your pictures are very well taken! After I read the above mentioned names from others, I know I can't top those with a name of my own! Aw, he is a cutie. Nice of him to help clean up the mess left my the birds. Hi Donna. I love squirrels and you got some very cute shot here. Anni is right about them sensing you. They are very clever. But with some nuts...they love pecans...and a lot of patience you can make a semi-pet out of them. My husband has done it several times. He always names them Buddy. Thanks for sharing this cute little guy with us. My cats keep all of my squirrels way away now and I rarely get a good shot! SO cute, what about Chip or Dale? Thank you for sharing on Weekly Top Shot #67! I can't but love the little guys,too. But we haven't found a squirrel proof feeder, yet. They are quite clever. Love your pics of them. Aww, I love squirrels! What a cutie! 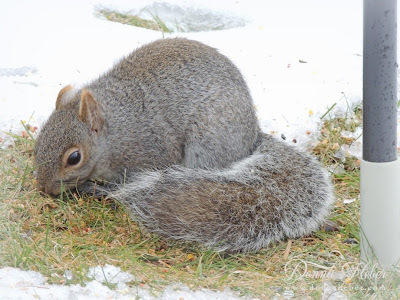 Visiting from the Sunday Social hop, thanks for sharing your squirrel pics! Such a cute little squirrel! such sweet and gentle eyes... lovely. He's a cutie. I have over 15 in my yard, and I've named them all, so I've run out of ideas. Following you all over from the Let's Get Social Sundays hop. Maybe Bosquo for the squirrel name. I tried to find a boy name that started with "Sq", but that is really, really hard. At least "Bosquo" has the "squ" letter combination in there. Oh yes, ....he knew you were watching him. I actually thought I saw him smiling at the camera! What great images! Thanks for joining us. Ha! That is really cute. I don't think I can ever really appreciate squirrels. One tried to attack me for my bagel I was eating (city squirrels), and I've never been a fan since! I'll be it smells heavenly.. I adore squirrels. We don't see many down here. In fact, I haven't seen any since we moved to this new place (back in September).